Nepal trip packages are as diverse as the country’s diversity. The country rises up from sweltering heats of Terai approximately 60 meters above the sea level and culminates to 8,848 meters to the highest monument of Earth the Mount Everest. Furthermore, this small country cultivates diverse landscape, culture, tradition, and lifestyles of people living in it. Moreover, thanks to this diversity, Nepal tour packages come in a variety. Nepal has preserved kaleidoscope if linguistic, ethnic, and cultural traditions rivaled by few nations. Dozens of the different ethnic group live among its Terai, hilly, and mountainous region, each with their own language, costumes, and beliefs. Consequently, this makes cultural Nepal tour packages highlight of the country. With Superb mixture of man-made treasures, traditions, sophisticated culture, and temples and statues dating back to the fourth and fifth century, Kathmandu truly is the cultural capital of Nepal. This miraculous city has often been cited as “Living Cultural Museum” or “An Open Air Museum”. It is a living, breathing entity, a vital traditional culture that has, miraculously survived to this 21st century. The old town focused around the former Royal Palace or Durbar Square, is the first and must-see attraction in Kathmandu. Furthermore, the holy sights of Boudhanath Stupa, Swayambhunath Stupa “Monkey Temple”, and Pashupatinath are a must-see attraction. Furthermore, valleys other two cities: Patan, to the south across the river from Kathmandu city, and Bhaktapur city a bit farther out in the countryside are the places still in tune with its cultural traditions and historic roots. Scenic Nepal trip packages, offers wonderful Himalayan vistas, pristine lakes, and a various scene. Nepal no uncertainty, is one of the naturally gifted nations on the planet. Hospitable Nepalese individuals further upgrade these scenic packages visit with their appeal. The Nepalese individuals live among different scenes, rehearsing own way of life and religion. Travelers visit Nepal to see the magnificent view. However, return back recalling the hospitability of Nepalese individuals. Pokhara Valley without any doubt is a center to every scenic Nepal tour packages. Moreover, this valley is one of the most extraordinary and the beautiful places in the whole world. The main lakeside of the Pokhara is the tourist center in Pokhara. Furthermore, taking a boat and paddling around the Phewa Lake “Phewa Tal”, enjoying this peaceful lake with the views of Himalayan peak filling the skyline will be one of the memorable experiences. Furthermore, visiting Sarangkot the best viewpoint in the valley and admiring the first rays of the sun illuminating the majestic Annapurna Panorama is simply breathtaking. 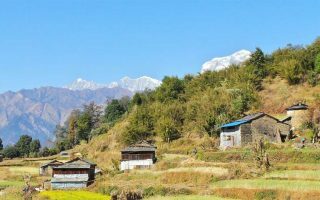 Additionally, Bandipur hilltop town, overlooking Dumre town, with an excellent view of Marshyangdi Valley and a broad sweep of Himalaya from Dhaulagiri to Langtang. This is a beautiful hilltop town located south to the Kathmandu – Pokhara valley. One night stay in Bandipur is worth your visit. Nepal offers plenty of scenic spots, further, the Northern part of Nepal still remain unexplored. However, due to no roadways and proper trekking trail, till date, these places remain secluded. If travelers have a short time, then Nagarkot hilltop town is a perfect destination for scenic beauty. It is an ideal place for the mountain watchers. This place will nearly always be rewarded with the Mountain View. Likewise, the surrounding countryside is great for walking and even provides an opportunity for various scenic hikes. Hiking is one of the popular adventure activities in Nepal. Nagarkot offers plenty of scenic hiking trails. One of the popular hikes is Nagarkot to Changu Narayan hike. The walking trail is fair board and a pleasant downhill stroll. This steep path will provide travelers with great views of the Himalaya range in the north, beautiful terraced fields, and villages. Travelers can halt at any one of Chautaras “Resting Point” and chat with the local people. Nepal has more than 800 bird species, which is 10% of the world species. At the top of the food chain is elusive Bengal Tiger. Likewise, spotted leopard, endangered one-horned rhinoceros, spotted deer, sambar roam the Chitwan National Park in Inner Terai and Bardia National Park in Western Terai. Nowhere, the beauty of wildlife is better displayed than in the steamy jungles of Terai. The most accessible wildlife sanctuary is Chitwan National Park. It is one of the well-managed wildlife sanctuaries in Asia. Today this park offers one of the finest wildlife experiences in Asia. One should be extremely lucky to see elusive Bengal tiger and leopard. However, during famous elephant back safari, you are certain to see rhinos, various species of deer, monkeys and numerous species of birds. Adventure tourism in Nepal dates back to the early attempts to scale the world’s highest peaks. While trekking and mountaineering have long been popular, an entire range of other possibilities have been explored in recent years – rafting, biking, fishing, rock climbing, paragliding, ultra-light aircraft, zip line, mountain flight, boating, pony treks and bungee jumping, swing, extreme biking in Annapurna region, canyoning etc;. Nepal is trekkers’ paradise. The only way to experience Nepal’s unbeatable combination of natural beauty and cultural richness is to trek through them. The immense contrasts in altitudes and climates found here support an equally spectacular mix of lifestyles, vegetation types, and wildlife. It is the perfect way to escape the hustle and bustle of everyday life and to relax and enjoy nature at its very best. It is walking from one village to other on the well-established trail, through rhododendron forest, waterfall, and hot spring and old style wooden bridges. Nepal trekking packages may take from a few days to a few weeks. In all kinds of trekking in Nepal, you will require walking 4 to 6 hours daily on uneven terrain, which demands physical fitness as well as mental preparedness. Trekking routes are classified as easy, moderate or strenuous on the basis of trail condition, altitude, glaciers, and passes. One with cardiac and pulmonary history is required to take the instruction of a physician before deciding to participate but is definitely not recommended going on a strenuous trek. It is good to have some knowledge about altitude sickness, its symptoms, prevention, and remedies. As most of Nepal trekking packages do not include insurance, trekkers should buy insurance from their home country. The insurance policy should cover for helicopter evacuation expenses in the eventuality of serious illness or accident or helicopter evacuation if trekkers get stranded. In conclusions, Nepal is a dreamland for all types of travelers. Nepal Packages includes the border ranges of activities as per the requirement of clients. Further other tours such as Photography tour, Incentive tours, Weddings also come with Nepal tour packages.